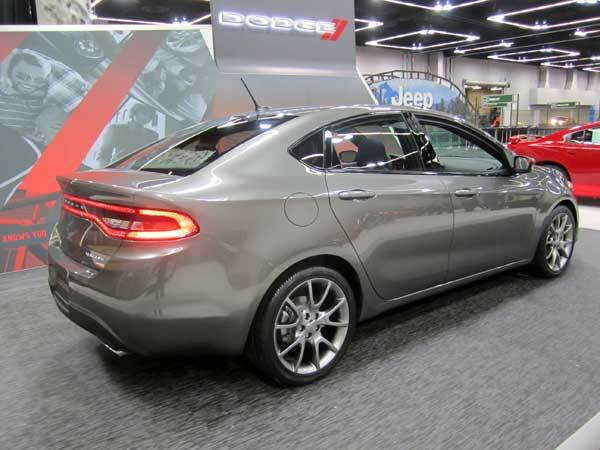 Dodge brought the all-new 2012 Dart to the 2012 Portland International Auto Show, and I'll say—it's a good looking compact car. The overall shape is very attractive, sleek, and modern. 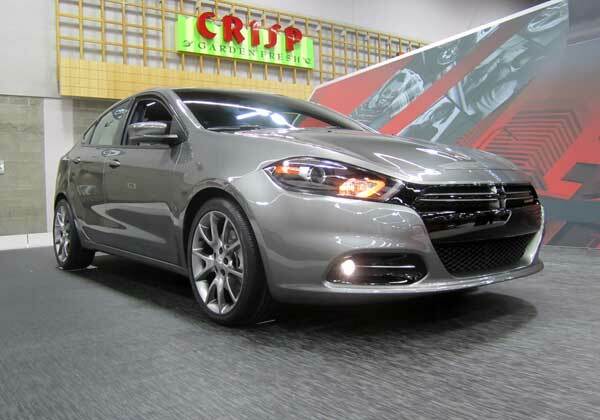 It's the first time Dodge has had a C-segment sedan in the lineup since the departure of the Dodge/Plymouth Neon. Unlike the Ford Focus, Mazda3, or Kia Forte, the Dart is only available as a sedan. The Dart's underpinnings are based on the Alfa Romeo Giulietta, but has been modified for the North American market. Fuel economy data has not been released, but I'm betting one of those powerplants will net 40 MPG on the highway. There will be a number of trim levels; the Rallye model pictured here has the 1.4-liter Multiair engine. A higher-performance R/T package will be available with the 2.4-liter engine as well as suspension upgrades. Dart features a fully independent suspension with different spring rates per the different models (base, Rallye, R/T). All Darts come with four-wheel disc brakes. There is no limited slip differential, but the effect of such a unit is mimicked using the vehicle's braking system. There will be as many as six wheel choices, too. 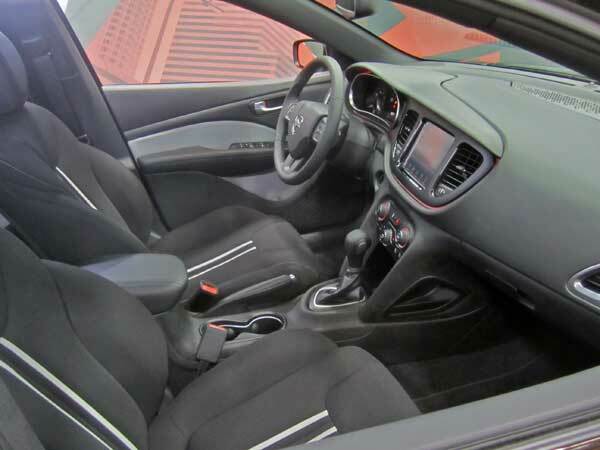 Dart's interior looks well designed, too. There is an army of airbags, a good amount of storage, and a cavernous glove box. We were told the gauge cluster will be customizable with nearly 150 different options. Around back, the tail lamp treatment may look familair. That's because it is similar to that found on the Dodge Charger. 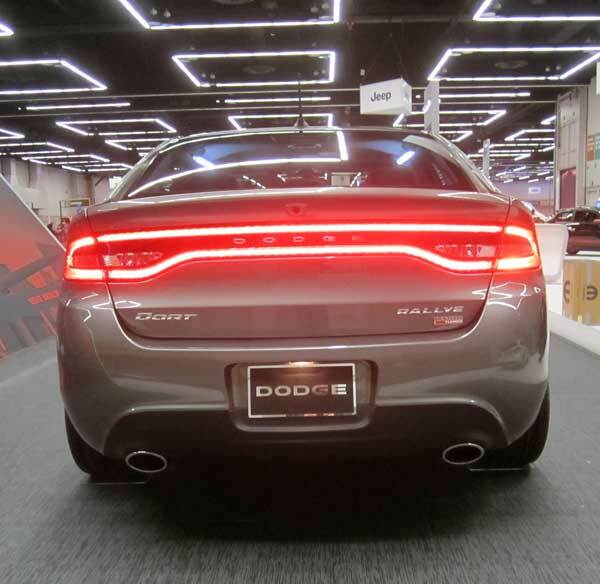 The Dart uses more than 120 LEDs to created the "racetrack" look, as Dodge calls it. Only the corners and center brake lights illuminate when stopping, though. The dual exhausts look muscular; I like the appearence. 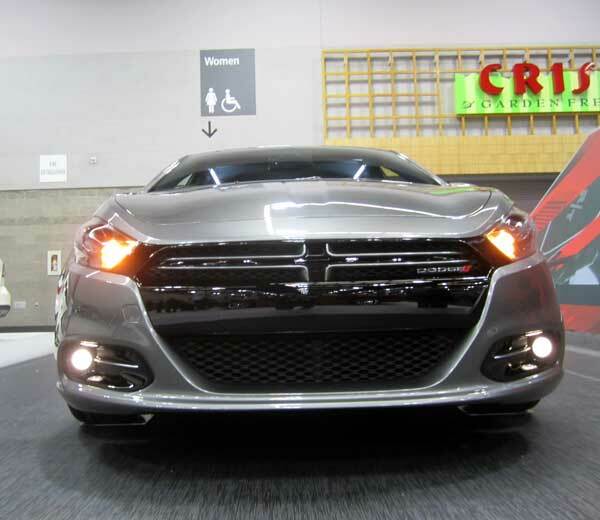 Dart's front fascia is sleek and menacing. The lower grille section has louvers that open and close to increase fuel economy. Proejctor head lamps are standard; Xenon lamps are optional. I think Dodge has a hit on its hands. This is an attractive car with a plethora of available features, tons of options through both Dodge and Mopar, and a host of powertrains. No limited slip??! Dang it! I'm hoping there'll be a hatchback eventually, given that the Giulietta IS one. After my mother's experience with a '95 Neon, I'd stay away from the first model year anyway. I like the Rallye cloth seats. Why do car manufacturers insist on the interior glamour shots being the black leather version, and then make it worse by using a black backdrop outside the windows? It just doesn't look very inviting in pics, guys.